(Culver City, CA – September 10, 2016) – The Wende Museum of the Cold War celebrated the groundbreaking of its new home at the historic former National Guard Armory Building on Culver Blvd. “The Wende was Culver City’s most secret treasure—but it’s not a secret anymore,” said Culver City Mayor Jim Clarke. 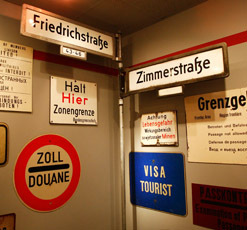 The Wende Museum was founded in Culver City in 2002 to preserve the art, artifacts, and personal histories of Cold War–era Eastern Europe and the Soviet Union. What began as a grassroots initiative quickly grew into an unparalleled resource for the vanishing history of the Cold War. Recognizing the Museum’s growing stature in the community, the City of Culver City has partnered with the Wende to transform the 1949 National Guard Armory Building and grounds into a vibrant, contemporary space for learning, research, and public engagement. The site, originally designed to prepare for World War III, will now be reimagined as a center for preserving and interpreting Cold War art and history. “The Wende is joining with other cultural organizations such as the Mayme A. Clayton Library and Museum, the Culver City Historical Society, and the Sony Pictures Entertainment Museum to form a museum district in Culver City,” Mayor Clarke noted. With the Kirk Douglas Theatre and Jazz Bakery also nearby, the Wende will be a key part of a growing cultural corridor. The launch next year of The Wende Museum at the Armory will make its collection of more than 100,000 available to curious viewers and dedicated scholars alike, with greatly expanded visiting hours and a full program of innovative exhibitions and events. The Wende will open at the Armory Building in fall 2017. The Wende Museum is currently located at 5741 Buckingham Parkway in Culver City, California. Open free to the public every Friday from 10 a.m. to 5 p.m. or by appointment. For more information, 310-216-1600, www.wendemuseum.org.